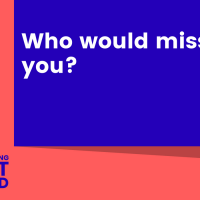 Marketing Out Loud: Episode 116 - Who would miss you? Would anyone miss your marketing? I’ve been publishing a daily podcast for the last 100 days or so. It’s been a lot of fun. And to be honest, it hasn’t been that hard. But ever since I started publishing more frequently here on LinkedIn, it’s been tough to maintain both. So last week, I put a hold on the podcast. To be honest, it wasn’t a deliberate decision. We just ran out of episodes and I didn’t have the headspace to record more. It was on my list of things to “figure out” (that’s a long list). Then on Monday, I was on a call with a group of clients. To be honest, I was taken aback by the question. I knew the podcast was valuable. I’d gotten that feedback before. But I guess I was surprised that people noticed I stopped publishing. It had only been a week. Would anyone notice if it was gone?